The premier West Hollywood and Greater Los Angeles screening of the film Pilgrimage From Scattered Points by Scottish artist Luke Fowler. 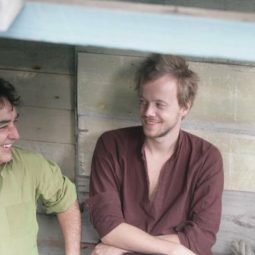 The film takes as its subject the Scratch Orchestra, a seminal collective of artists and musicians formed in the UK by Cornelius Cardew with Howard Skempton and Michael Parsons in 1968/1969. In addition to the screening, SASSAS is presenting a panel on intersections between radicalism, collectives and experimental art and sound practices and a performance based on the Scratch Orchestra Draft Constitution. Panel participants include Branden Joseph, Bob Ostertag, Dont Rhine (Ultra-red), and Wadada Leo Smith; Haruko Tanaka, moderator.Panel participants include Branden Joseph, Bob Ostertag, Dont Rhine (Ultra-red), and Wadada Leo Smith; Haruko Tanaka, moderator. Performance: Glenn Bach, Mitchell Brown, Ted Byrnes, Andy Featherston, Joseph Hammer,William Harrington, Ian Henderson, Anna Homler, Michael Intriere, Gregory Lenczycki, Dave Muller, Alan Nakagawa, Diane O’Rourke, Jasmine Orpilla, Albert Ortega, Corrina Peipon, Rick Potts, Steve Roden, William Roper, Kira Vollman; Cindy Bernard, Jorge Martin, Joe Potts, conductors. The recipient of the 2008 Derek Jarman Award from the Serpentine Gallery in London, Luke Fowler creates cinematic collages that break down conventional approaches to biographical and documentary film-making. Populated by maverick figures such as anarchic musicians, experimental psychoanalysts, and other unconventional figures, Fowler’s films compose a personal history of dissent and liberation. Fowler has exhibited internationally in solo presentations at The Serpentine Gallery, 2009, Kunsthalle Zürich, 2008, and White Columns, New York, 2006) and his work was recently included in The Generational: Younger Than Jesus (2009) and in the Yokohama Triennial (2008). 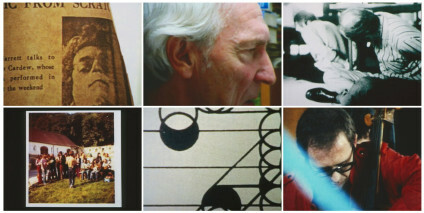 A selection of Fowler’s films is on view at X-Initiative, New York through October 2009. Bob Ostertag‘s work cannot easily be summarized or pigeon-holed. He has published 21 CDs of music, two movies, two DVDs, and three books. His writings on contemporary politics have been published on every continent and in many languages. Electronic instruments of his own design are at the cutting edge of both music and video performance technology. He has performed at music, film, and multi-media festivals around the globe. His radically diverse collaborators include the Kronos Quartet, avant garder John Zorn, heavy metal star Mike Patton, jazz great Anthony Braxton, dyke punk rocker Lynn Breedlove, drag diva Justin Bond, Quebecois film maker Pierre Hébert, and others. He is rumored to have connections to the shadowy media guerrilla group The Yes Men. In March 2006 Ostertag made all of his recordings to which he owns the rights available as free digital downloads under a Creative Commons license. He is currently Professor of Technocultural Studies and Music at the University of California at Davis. Wadada Leo Smith, a trumpeter and multi-instrumentalist, composer and improviser, has been active in creative contemporary music for over forty years. His systemic music language Ankhrasmation is significant in his development as an artist and educator. He is currently a faculty member at The Herb Alpert School of Music at California Institute of the Arts where he is the director of the African-American Improvisational Music program. He has been a member of the Association for the Advancement of Creative Musicians (AACM) since 1967. Smith’s awards and commissions include: John Simon Guggenheim Memorial Foundation (2009-2010), Jazz Journalists Association Jazz Award (2005), Islamic World Arts Initiative of Arts International (2004), Meet the Composer/Lila Wallace-Reader’s Digest Commissioning Program (1990, 1996), Asian Cultural Council Grantee to Japan (June-August 1993), New York Foundation on the Arts Fellowship in Music (1990), Numerous Meet the Composer Grants (since 1977), and National Endowment for the Arts Music Grants (1972, 1974, 1981). 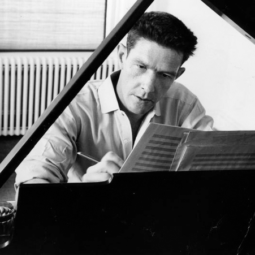 In addition to working with his own ensembles, Golden Quartet, Silver Orchestra, and Organic, his compositions have also been performed by AACM-Orchestra, Kronos Quartet, Da Capo Chamber Player, New Century Players, San Francisco Contemporary Music Players, Contemporary Chamber Players (University of Chicago), S.E.M. Ensemble, Southwest Chamber Music, Del Sol String Quartet, New York New Music Ensemble, ne(x)tworks, and California E.A.R. Unit. 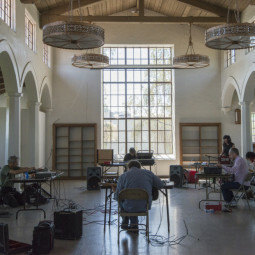 Founded fifteen years ago in Los Angeles by two AIDS activists, Ultra-red conduct sound-based investigations alongside social justice movements. While the image determines much of our understanding of activist art, Ultra-red turn the focus to the ear; the sound of communities organizing themselves, the acoustics of contested spaces, the demands and desires in our voices and in our silences, and the echoes of historical memories of struggle. Their investigations take the form of audio recordings, art exhibitions, events, or sound walks. Coming together from experiences in music, visual art, community organizing, social research, choreography, and education, the nine members of Ultra-red have worked with the autonomous community development organization Union de Vecinos (Los Angeles), the German anti-racist network Kanak Attak, the Rural Racism Project (Devon, UK), Community HIV/AIDS Mobilisation Project (New York/Los Angeles), and Woodcraft Rangers which facilitates programs in sixty-one schools in Los Angeles County. Born in Queens, New York, raised in England and Japan before coming back to the U.S. in the early 1990’s, Haruko Tanaka has a keen interest in the transmission and translation of cultural traditions and the creation of community. Her artistic practice ranges from photography and film/video to collaborative performance, events, and workshops including a Manifesto writing workshop at South Central Farms and an Arabic lullaby workshop “The Other Lullaby” as part of “The Other Project” in Valencia . She is also one half of the intuitive artist duo Krystal Krunch who recently completed an energy assessment of the Armand Hammer Museum for the museum and Machine Project. Haruko is also a surfer and a practitioner of Tibetan Buddhism. 4-5:00 p.m. – Performance (1 hour) 7:00 p.m. – Film Screening and Panel Photo credit: Luke Fowler Pilgrimage From Scattered Points 2006 DVD, colour and b/w, sound 45 mins Photo : Ruth Clark Courtesy of The Artist and The Modern Institute/Toby Webster Ltd, Glasgow.